German ritual black ‘n’ roll band Possession Ritual released a full-length going by the name of Incense of Opened Gates, with striking artwork by Ars Leprosa in the year 2011 through Nihilward Productions. A note is made that the music itself was written and recorded in 2006. Being one of those limited editions which are rather hard to come by and probably also partially hidden away from the unworthy prying eyes of mundane minds, the author has only been able to listen to two pieces from the album. Hence, all commentaries and reflections upon the band’s work can be traced to perceptions of these exclusively. It will be useful to meditate upon a holistic impression of the band as an entity, and to take each of those to tracks to task separately, to finally arrive at a judgement of the musical work as manifested result of a series of evocations. With many bands consciously projecting images based on traditions of different sorts, and the communication medium being so easily accessed and operated, the explorer may find more than a few obstacles in separating pretenders from truly dark artists. This in itself takes time and energy, and even then, this may not be a guarantee of musical quality itself. Everything must converge. To be a committed occultist and to have an artist gift of any kind are interrelated but ultimately distinct. Hence, the artwork style and the willingness of the visual artist involved in this release to provide his own counterpoint to the main sonic product is a seal of approval of sorts that helps us in deciding how serious this is. The flavor is that of a band seeking knowledge through experience in the dark and solitary confinements of the mind and the universe. Explicit fact it is that the dangerous path of open sorcery is tread, and the music in question projects this insanity through delightful progressive pieces that remind one of the darker side of Kraut occult rock, stripped from their rock n’ roll context and thrown without warning into the void of later aesthetic developments in metal music. Possession Ritual should not be thereby classified as a nostalgia act as it does not let itself fall into the mold of the old forms but channels them forth through the filter of black metal, even going as far as to adopt war metal tropes in brief moments that are only perceptible for one consciously trying to discover links to the exterior within its confines. The description progressive should be taken in its highest acception and not taken to mean the particular degraded genre we have unfortunately come to know. The first track, “Exorcismus”, appears early on the album, and starts with a simple melody over midpaced drums and slowly-moving strummed power chords. Over them, a male voice initially declaiming in plain voice what would seem to be lines from a Grimoire. Screeching vociferations cut through the ending lines and percussion leads the transition into a double time, minimalist, soft blast beat stream of pulsations, which for its simplicity contains a remarkable flexibility in the dynamics of intensity. This is aided by the apparent ability Possession Ritual wields that allows it to measure, through intuitive processes more than through mechanical science, the appropriate life expectancy of the riff cycles. The song then comes back to the previous idea and finishes. On its own, this interesting but can only be taken as a long acclimatization before the Climb. 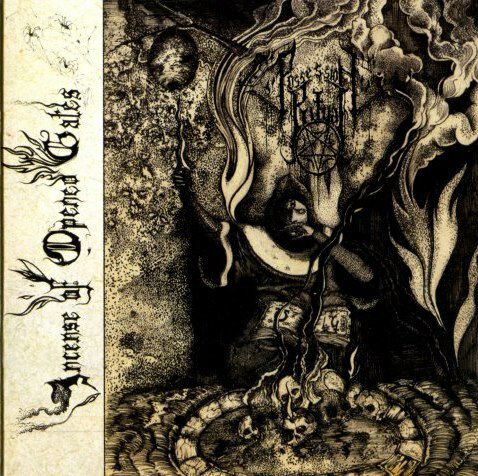 “Aura of Flies” occupies the fourth place in Incense of Opened Gates and it proves fulfillment of the promise made by the second, “Exorcismus”. The piece goes through incredibly organic changes of texture that are made almost imperceptible by the careful maintaining of tempo without the drums turning into infertile ground for syncopations, fills and declensions of aristocratic finesse. Theme transitions are brought exactly when they are needed and these do not overstay, being carefully weighed as to the nature of their elasticity in order that they may give way to the next in due time. Variety in every sense is provided without any sense of disparagement being received from the whole of the composition. The narrative curve thrusts through patiently and arches exquisitely as the song sinks and rises, to give way to an ending mantra painfully distorting proximate reality. Such an ability to balance yet utilize rock instruments to their utmost potential through the lenses of black metal is rarely found, and such expertise directed towards the realizations of ritual sorcery rather than for the contentment the musician’s ego may find in the parading of technical abilities, makes this album more than worthy of praise. None of the instrument exceeds its function so that any pattern jumps out as a playful gesture, yet each of them provides functional variety, turning each action into a step more in a natural ritual that is discovered, not learned or fabricated. Wow. I haven’t been truly impressed by any new bm/dm in a while, with the exception of Sammath and SDG. Sounds like Scorpios combined the decrepit production and guitar tone of early mutiilation, decorated with broken pieces of Portal’s dimension-shifting wallpaper music and wrapped it around the haphazard rock structure of A Blaze in the Northern Sky. Despite the influences apparent, this band breathes with a spirit and inspiration all its own. Refreshing.